Join Harold the blue baboon in this hilarious children's picture book, as he travels to the moon, in a big balloon, with an outrageous cast of friends! This creative rhyming book will inspire children's imaginations to soar to new heights! 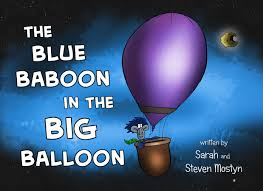 The Blue Baboon in the Big Balloon was such a fun read! I loved the creative story, tongue-twisting rhymes, and illustrations. The authors--a husband and wife team--have created such a unique and whimsical book. This book reminded me of Dr. Seuss, in a good way. The book starts by introducing Harold, the blue baboon who lives in a big balloon. Harold and his brother Gerald share the balloon with an diverse cast of characters. I loved the way each character was introduced, and how they were intertwined. It was enjoyable and inventive, to say the least. The trip to the moon was pure fun. The illustrations made this book so special, but the text was my favorite part. The cadence was perfect, the rhymes were great and even a little tongue-twisting. The book was the perfect length: short enough to hold Kaitlyn's interest (she's three years old), but long enough to maintain an interesting story line. The words were spaced evenly from page to page (a children's literature pet peeve of mine is when there are some pages with paragraphs of words and then some pages with two to three words---it makes for a choppy, uneven reading experience, in my opinion). Some children's books get boring for me: I find myself mentally cringing when Kaitlyn pulls them from the shelf. This book, though, is one I would enjoy reading over and over again!